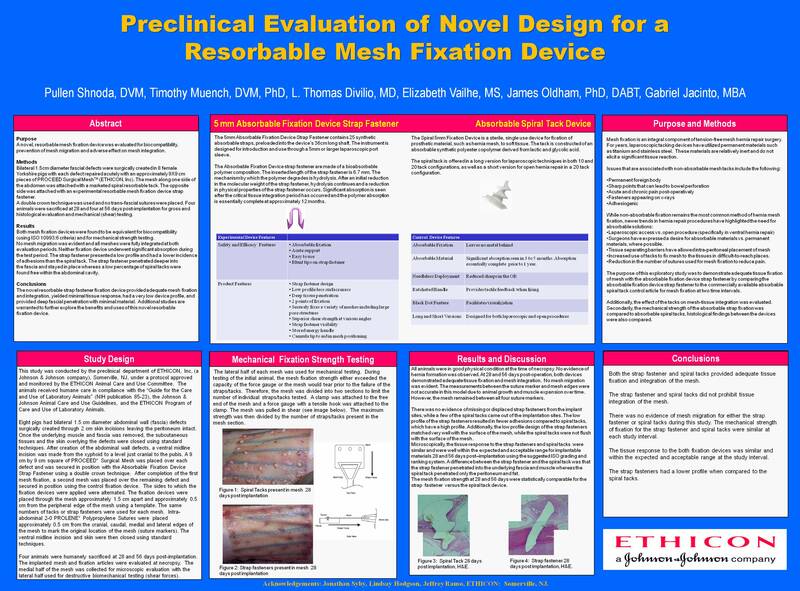 The purpose was to evaluate a novel design for resorbable mesh fixation with regards to biocompatibility, prevention of mesh migration and to determine if the resorbable material produced any adverse effect on tissue integration. Eight female Yorkshire pigs underwent surgical creation of a 1.5cm fascial defect on each side of the abdominal midline. Defects were repaired acutely with 9X9cm pieces of PROCEED Surgical Mesh. On one side, the mesh was attached with a marketed spiral absorbable tack. The opposite side was attached with an experimental absorbable barbed strap. A double crown technique was used and no trans-fascial sutures were placed. Four animals were sacrificed for gross and histological evaluation at each of 28 and 56 days. The previously marked abdominal wall was examined for mesh migration. Specimens were examined histologically for tissue integration and tissue reaction. Both mesh fixation devices were found to be equivalent with regards to prevention of mesh migration and strength of mesh attachment. All mesh samples were fully integrated at both evaluation periods. Tissue response to both devices was similar by ISO criteria. Neither device appeared to interfere with tissue integration into mesh. Neither underwent significant absorption during the test period. The strap device presented a lower profile and had a lower incidence of tissue attachment than the spiral tack and its longer length allowed deeper tissue penetration. The absorbable strap fixation device produces adequate mesh fixation with minimal tissue reaction and allows for adequate tissue integration in a porcine model. It appears to result in a lower incidence of tissue attachment, penetrate more deeply into fascia and separate from the mesh less frequently than the spiral absorbable tacking device. Additional studies are warranted to confirm and understand the significance of these findings.